Back in high school, I devoured Stephen King novels. 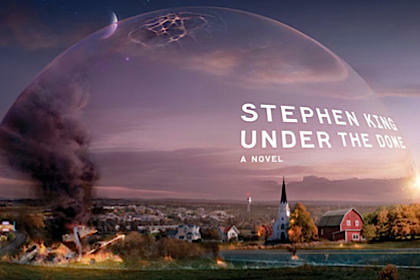 I must have been feeling reminiscent for those days several months ago when I picked up his massive 2009 work called Under the Dome. The only other King book I've read in the past 20 years was Just After Sunset, but the Dome intrigued me because it sounded like my favorite King book, The Stand, which still holds up as one of the very best novels I've ever read. Sometime after 2012, Chester's Mill, Maine is cut off from the rest of the world by a giant clear and unbreakable dome. The lead character is former Army Captain Dale Barbara, who is on his way out of town for good after a run-in with some of the local toughs. He doesn't quite make it before the dome comes down. Used-car salesman "Big Jim" Rennie is on the town council and sees the perfect opportunity to become the town's leader in its time of need. His son, Junior, has an as-yet-undiagnosed brain tumor that is leading him down a murderous path right at the same time his dad is appointing him as one of a thuggish team of beefed-up police-force officers. Colonel James Cox works the situation from the outside, instructing the town that the president has appointed Barbara as the town's leader. Needless to say, this doesn't go over so well with Rennie, who is able to frame Barbara for a handful of murders and have him locked up and ostracized. Eventually, a small band of renegades is able to see through Rennie and break Barbara out of jail. They head to a farmhouse outside of town, near where they have discovered the source of the dome. The sci-fi part of this story is not as well fleshed out as the fascinating good-versus-evil relationships between the town's characters under such dire circumstances, although the dome creators (whose identity I won't spoil here) is a pretty ingenious concept by King. A massive explosion of the methane tanks and crystal meth materials at Rennie's illegal operation ushers in the dramatic close of the novel, which the world watches on TV through the news media's lenses covering the events from just outside the dome. Lots of love, death, and fun. Highly recommended. Just plan to spend a while with these 1,500 or so pages. ****1/2 out of ***** stars.